Safety •Control panel power off automatically when no operation over 1 minute,avoid any mis-opeation. •Imported gas springs guarantee smooth movement. •Imported round-hole clamps, easy to look and unlock accessories, safe time during operation. An operating table is used to place the patient in the best position for a given type of surgery. It consists of a platform resting on a central support. The platform may have several sections, while the support structure enables the height and inclination of the table to be adjusted. Flexible configuration and adjustments are designed to place the patient in a variety of positions. For example, back surgery requires that the patient be prone, while a semi-reclining position is indicated for ENT operations. MedicalExpo offers a great diversity of tables organized by medical specialty. 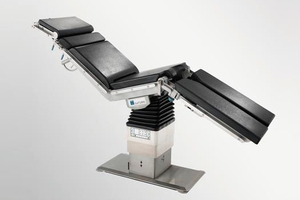 Many tables are designed for a particular type of surgery, though height and inclination remain adjustable to offer the surgeon the best possible working conditions. It is also possible to differentiate tables by the nature of the adjustment mechanism, including electric, pneumatic and hydraulic systems. Numerous accessories are available to provide additional patient support required for particular types of surgery, for example in the case of orthopedic operations. Choice will depend on the surgery to be performed. Each type requires the patient to be in a particular position, determining the selection of an appropriate table.